As if we weren’t already force-fed advertisements just about everywhere we go, now get ready to see them at high school sporting events. Is it an innovative solution to tough financial times? Or by allowing advertising on school scoreboards, are cash-strapped schools shaking hands with the devil? 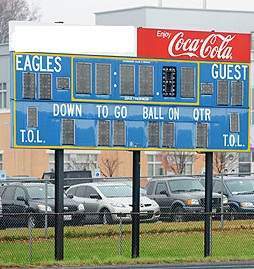 Glenbard High School District 87 is a step closer to attaching scrolling LED advertising panels to existing indoor and outdoor scoreboards at its four campuses, a move that could collect up to $ 100,000 annually. Not everyone is fully in favor of the program, though. “I am concerned from a societal standpoint that we are getting sucked into this dollar vortex of sports in this country,” board member Tom Voltaggio said.